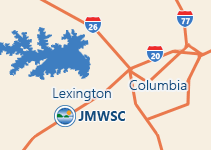 The Commission’s collection system currently operates twenty five sewer pump stations and maintains over forty seven miles of gravity lines. Over thirty six miles of sewer force mains, thirteen hundred manholes, and over one million gallons of sewer a day. Cooking grease poured down the sink drain can block sewer pipelines when it congeals and cause sewer backups and overflow into the environment, and into your home! Sewer backups or overflow can cause increase in operation and maintenance for the Commission, which causes higher sewer bills for customers! Sewer backups in a home service line may result in costly repairs to the customer. In addition to sewage spills and odor, FOG also attracts insects and animals. Never pour fats, oils, or cooking grease down the sink or garbage disposal. Pour excess grease into a container with a tight fitting lid and freeze for disposal with your household garbage; and wipe the remaining grease from the pan with a scraper or paper towel. Tell your friends and neighbors about the problem of grease in the sewer system and how to keep it out. Consumer products can be misleading. Just because a product is labeled as “biodegradable” doesn’t mean it is safe to flush. Toilet paper and human waste are the only things that should ever be flushed down the toilet. Flushing other items could cause blockages in your sewer pipes which in time will cause the sewer to back up into your home.